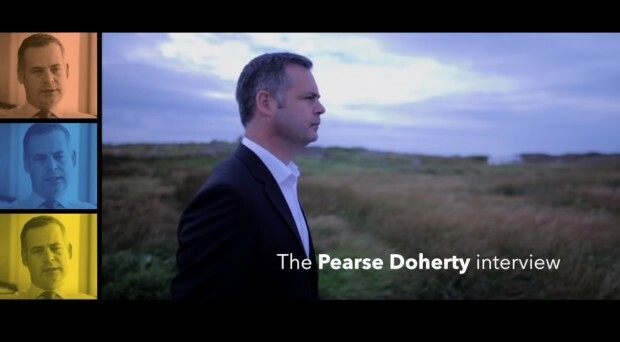 Sinn Féin TD and Finance spokesperson Pearse Doherty has spoken of his origins, his life and how they influence and inform both his political ideology in an extended online interview. He also outlined his vison for a New Ireland that provides a chance for people to live, to work and to raise their families without the chronic levels of deprivation and inequality facing so many today. Speaking ahead of Sinn Féin’s Alternative Budget launch next week Deputy Doherty laid out his party’s vision “for a new economy for a New Ireland”. The Donegal TD was born in Glasgow and lived with his parents and five siblings in a one-bedroom flat in Ibrox before the family returned home to Gweedore in Donegal in the 1980’s. This informed his belief that no matter when someone left Ireland, even if it were 40 or 50 years ago, they still have a great sense of belonging, of that tangible bond with home “that’s home - you know - Níl aon tinteán mar do thinteán féin - that’s their home”, commented Teachta Doherty. Pearse, who has been a TD since 2010, talked about his drive home when the Dáil wraps up at the week’s end, crossing the border twice on his way up the winding road to Donegal to his wife and four boys. He also gave an insight into the difficulty of the balance between work and home life, and the unique challenges of being a public representative. The Gaoth Dobhair resident added that it is not solely challenges that come with being a Teachta Dala. Sinn Féin regularly faces accusations of employing “fairy-tale economics” or “economic illiteracy”. Pearse dismisses these comments as cheap throw-away remarks, designed to stunt political debate. As Pearse puts it, the Budget is not just about numbers - it’s about our values and ensuring we create a new economy with strong public services and shared prosperity where no one is left behind and no child goes without. Deputy Doherty said: “Society is organised in the wrong way. We should not have a housing crisis. What is happening with our children in emergency accommodation is immoral and it is a scandal that we will look back at in twenty years with shame. “What is happening in our hospitals is outrageous, in a country that has the wealth that it does. Touching on the spectre of Brexit, as a TD for a border constituency, Pearse argues that the North of Ireland remaining in the EU and given a Special Designated status is the only way to protect people on both sides, particularly Donegal which is isolated from the rest of the 26 Counties. Pearse also remarks that “the debate about Irish Unity needs to go to another level”. He continued: “We are moving, in my view, to a position where we will have a border poll. Where a majority of people will vote for Irish unity. Sinn Féin is not interested in maintaining the status quo and not content to merely “tinker along the edges - where you might get an increase in public services, an extra few gardaí, an extra few public sector workers, a little tax cut here” Pearse Doherty said. This Budget, and every Sinn Féin Budget, would be about our vision for a new Ireland and that vision of an equal and fair society. We would also focus on the political choices that have always been available to create that society if one is prepared to make them.